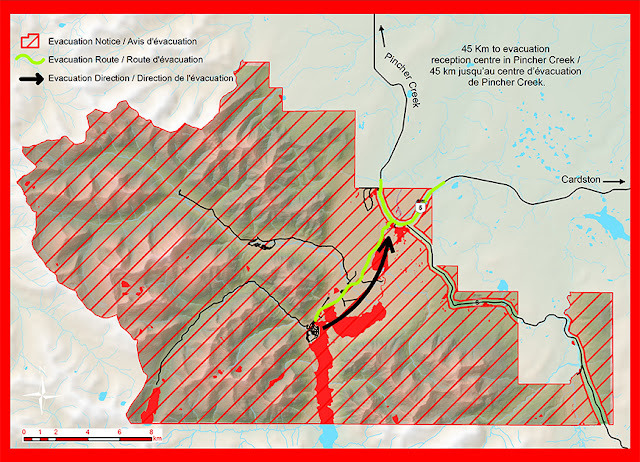 Parks Canada - Parks Canada is actively managing parts of the Kenow Fire that have the potential to impact Waterton Lakes National Park. The fire is primarily in British Columbia but has ignited spot fires in the park at the northwestern boundary near Sage Pass. Pursuant to Section 36(1) of the National Parks General Regulations of the Canada National Parks Act an Evacuation Order has been issued by order of the Superintendent due to a temporary danger to persons caused by the ongoing wildfire in the park. Members of the RCMP and Parks Canada staff will be expediting this action. Persons deemed essential to the firefighting operation are exempt from this order. All evacuees are strongly recommended to register at the Reception and Evacuation Centre located in Pincher Creek at the Vertical Church (1200 Ken Thornton Blvd., located just south of Co-op and Vista Village. For more details call our Information Line at 403-859-5109.